The Interpretation of Murder opens on a hot summer night in 1909 as Sigmund Freud -- already world famous and highly controversial -- disembarks in New York from a steamship. With Freud is his rival Carl Jung; among those waiting to greet him is Dr. Stratham Younger, a gifted physician who is one of Freud's most ardent American supporters. And so begins the visit that will be the great genius's first -- and only -- journey to America. 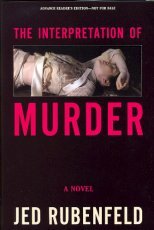 The morning after Freud's arrival, in an opulent penthouse across the city, a barely clad, beautiful woman is discovered murdered -- whipped, mutilated, and strangled with a white silk tie. The next day, a rebellious heiress named Nora Acton barely escapes becoming the killer's second victim. Yet the lovely Miss Acton, suffering from hysteria, cannot remember the terrifying incident or her attacker. Asked to consult on the case, Dr. Younger calls on the visiting Freud to guide him through the girl's analysis. As Younger is drawn into her story -- her desire to attend college, her rich, difficult parents, her rejection of the mogul who has fallen in love with her -- he comes to care deeply for this remarkable young woman, even as he discovers that she may still be in grave danger. Then Younger is pulled into another crisis: he learns of a series of bizarre events suggesting a conspiracy to ruin Freud's reputation. Joining forces with the mayor, the city's eccentric coroner, and a young homicide detective named Jimmy Littlemore, Younger takes part in a murder investigation that reveals the divided soul of a great metropolis on the verge of a sophisticated, violent new era. The chase for the culprit leads through New York, from the grand ballroom of the Waldorf-Astoria to the luxurious salons of Gramercy Park, from the rising skyscrapers that seem to dot every street corner to the bottom of the East River, where laborers are working on the new Manhattan Bridge. The Interpretation of Murder is an intricately plotted, elegantly wrought entertainment filled with delicious surprises, subtle sleights of hand, and fascinating ideas. Drawing on Freud's case histories, Shakespeare's Hamlet, and the rich history of New York, this remarkable novel marks the debut of a brilliantly engaging new storyteller.